Mainland China's explosion of cultural attractions, theme parks and resorts has a radiant new standard-bearer. Chimelong Ocean Kingdom is a world-class marine life theme park located on Hengqin Island, a verdant paradise just a short bridge away from the buzzing casinos of Macau. Chimelong Ocean Kingdom raises the bar for other Chinese park developers and demonstrates how much can be achieved with a combination of Western design and Chinese execution. Guests enter the park’s Ocean Main Street under a huge, arching LED video display simulating an underwater environment. 24 attractions (including 14 animal habitats and shows) give the park an impressive array of opening day activities. The Ocean Wonders aquarium boasts a number of new superlatives: the world's biggest aquarium, largest collection of fish, and biggest single viewing window make for a stunning undersea experience. New expansion attractions are already in the works. 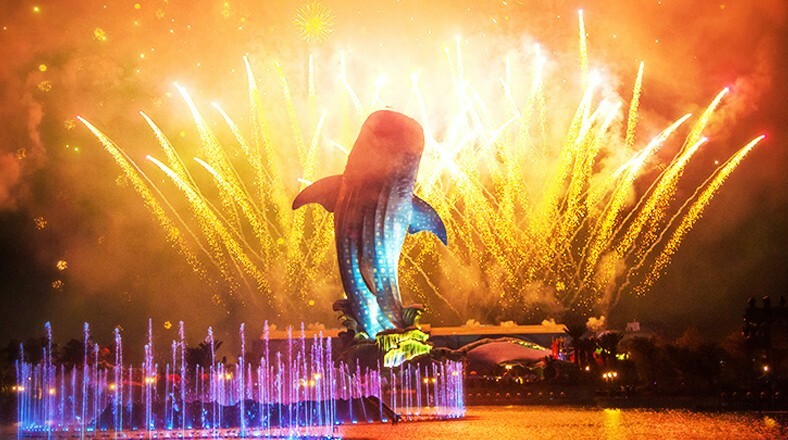 The beautiful Hengqin Sea lagoon at the park's heart serves as the stage for a dazzling nighttime spectacular. The Nominating Committee acknowledges that Chimelong's park isn't perfect. (Neither were many US parks when they first opened.) But taken in aggregate, the Committee (many of whose members have visited the park in person) agrees it's the biggest, grandest and best new park in China and deserving of the award because of its scale, ambition and opening day quality, along with its formidable plans for future growth.